Emmons is a Kentucky based Democratic political professional. He founded Emmons & Company, Inc. in 1990. Emmons was a Campaigns and Elections Magazine "Rising Stars" in American Politics in ‘98. His son Jamie earned the same honor this year. Dale has compiled a remarkable record of success, having been part of more than 740 winning campaigns; from Kentucky’s state house to it 120 courthouses. He has helped elect a number of women candidates to state and local offices up and down the ballot Sons Jamie (UK 2003; former top aide to Kentucky’s House Speaker & Named Rising Star in 2014; now Chief of Staff to the Lexington Mayor. ) and Will (Brown 2009; Graduated from UK College of Law in 2014. In private practice with his mother, Alison Lobb Emmons, at Emmons & Pucket, PLLC in Richmond, KY) have both worked at Emmons & Co., Inc. In Kentucky where politics is always colorful and competitive, Dale is widely recognized for his strategic mastery. Lexington Kentucky Mayor Jim Gray describes Dale as, “the real McCoy when it comes to politics . . . the Obi-Wan Kenobi of my generation.” Most recently Emmons helped guide Alison Lundergan Grimes, a young female attorney, to victory to become Kentucky’s Secretary of State. 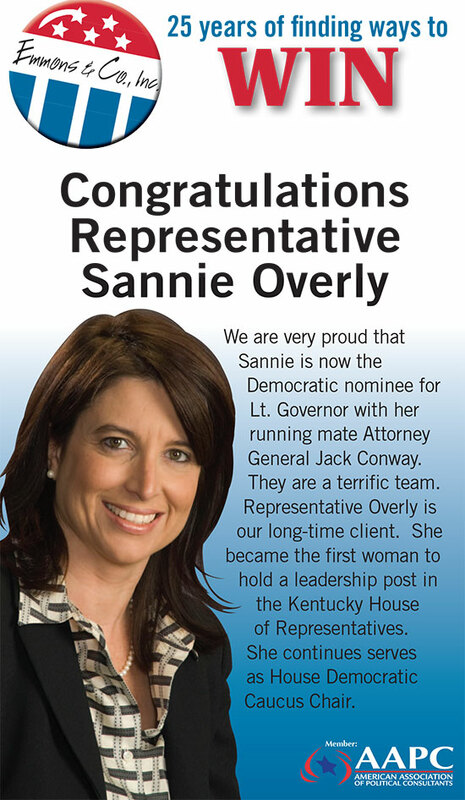 On the road to victory defeating the Democratic Governor’s endorsed incumbent in the Primary, went on to become Kentucky’s top Democratic vote getter in November becoming Kentucky’s youngest and only female statewide office holder! Emmons and Company is back in our offices and finalizing rehabilitation and restoration. 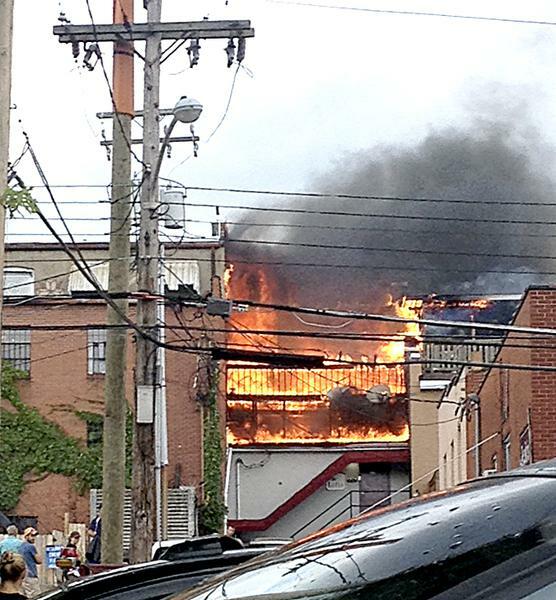 The Emmons and Company office building is in the process of completely reopening in Richmond after a July fire in an adjacent building. Unboxing and rehab are nearly complete, and an open house will be scheduled soon. 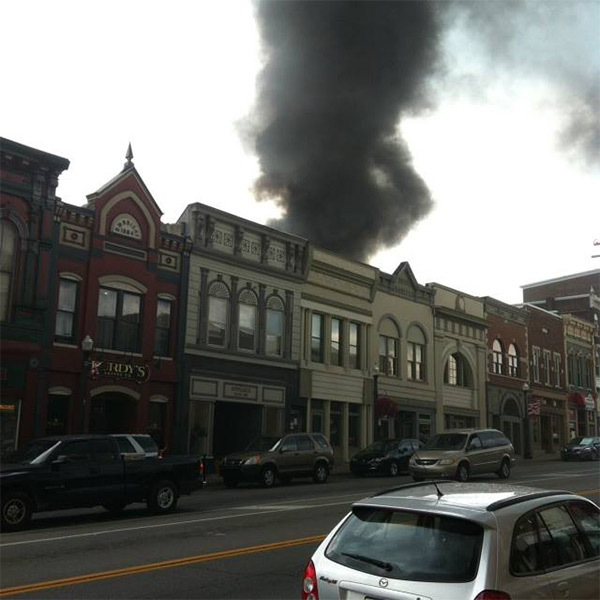 Watch politicskentucky.com or Dale Emmons’ Facebook page for more information. Thank you to all attendees for a successful conference! (McLean, VA, December 5, 2013). The American Association of Political Consultants (AAPC) joins in mourning the passing of industry great, Joe Napolitan, who died Monday in Agawam, MA at the age of 84. Regarded as the father of modern political consulting, his storied career spanned over 5 decades. Fellow Springfield Political Consultant Tony Cignoli said of Joe, “Napolitan set the standard, and the idea was that it had a code of ethics. If you broke that code of ethics, no other consultant who belonged to the group would then work with you. And it worked really well." 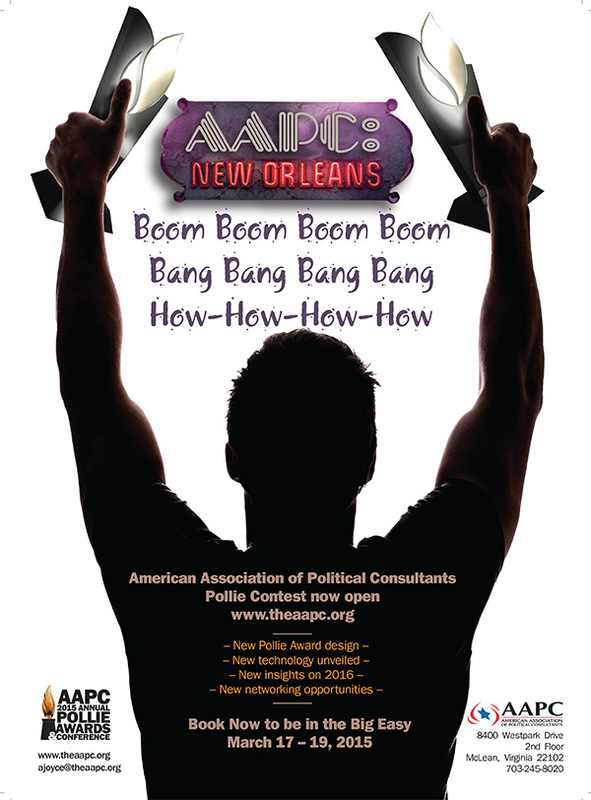 This ideal was embodied in the founding of AAPC in 1969 and the establishment of AAPC’s Professional Code of Ethics, to which all members subscribe. Joseph J. Napolitan, 84, world renowned political consultant died on Monday evening December 2, 2013 at Heritage Hall Nursing Home in Agawam. Joe was the son of the late Pasquale and Lucy (Anzolotti) Napolitan. He was born in Springfield on March 6, 1929. He attended Chestnut Street School, and Springfield Technical High School where he played football. After his graduation from high school he served his country with the United States Army in Guam during WWII. Then he attended and graduated from American International College. He worked for the Springfield Newspapers for 10 years as a reporter. He married Mary Nelen, a social worker, in 1952, and they traveled the world together. In 1956, Joe opened a consulting office in Springfield. His first political client was Tom O’Connor, who was elected Mayor of Springfield. Joe went on to help many people run their campaigns, including Charlie Ryan, John F. Kennedy, Hubert Humphrey, and Lyndon B. Johnson, and over 100 others in this country, all Democrats. He also advised candidates in over 20 countries, including the heads of states in France, Mauritus, Venezuela, Sudan, the Dominican Republic, and Costa Rica. Joe wrote the book “The Election Game and How to Win It” in 1971, which has been used as a textbook for managing campaigns. He coined the term “Political Consultant” and founded the American Association of Political Consultants and co-founded the International Association of Political Consultants, to promote ethical and creative campaign practices. Joe served on many boards, which included AIC, Kavanaugh’s, Fordham University Center for Electoral Politics and Democracy, and the International Foundation for Election Systems which helps countries run fair elections. Joe was kind, wise, generous, and a hardworking man who will be missed by many around the world. Joe was predeceased by his wife of 59 years, Mary, a son, Jay, a sister, Peggy Mann, and four brothers-in-law. He is survived by his children, Christina Napolitan of West Tisbury, MA, Luke Napolitan of Longmeadow, and Martha Cownap and her husband Ben of Kimberton, PA; 5 grandchildren, Lucy, Mary Sage, Francis, Clara, Diggory; along with many nieces and nephews and friends all over the world including Maggie Ryan, Joe and Laurine Michenfelder, Sally Hunter, Sandy Hutter, Pat Nelen, Angel Callado-Schwartz, and his secretary of over 55 years, Dorothy Sajdak. Visiting hours for Joe will be held on Friday, December 6, 2013 form 4 to7:30 p.m. at Sampson’s Chapel of the Acres Funeral Home, 21 Tinkham Road, Springfield, (413) 782-5226. His funeral will be Saturday, December 7, 2013 at 9:15 a.m. at the funeral home followed by the Liturgy of Christian Burial at 11 a.m. in Holy Name Church, 323 Dickinson Street, Springfield. Burial with Military Honors will follow in St. Michael’s Cemetery, 1601 State Street, Springfield. In lieu of flowers memorial contributions may be made to the Napolitan Scholarship Fund, c/o American International College, 1000 State Street, Springfield, MA 01109, the Springfield Boys and Girls Club, 481 Carew Street, Springfield, MA 01104 and to Camphill Village P.O. Box 1045, Kimberton, PA 19442. Dale Emmons named 2013 Influencer by Campaigns and Elections Magazine. Emmons and Company, Inc recognized with Reed Award for work on Alison Lundergan Grimes campign. "The Reed Awards recognize the very best in political campaigning and communications in the United States and the rest of the world. When you win a Reed Award you're joining an exclusive club whose members literally shape the political future with unparalleled expertise and skill," said Campaigns & Elections Publisher Shane Greer. Dale Emmons - Emmons & Company, Inc. was recognized with phone vendor Brad Chism - Zata3 Consulting with a 2012 Reed Award for their “In Granny’s Words” for the automated call a Statewide Candidate for their work on the Alison Lundergan Grimes for Secretary of State Campaign. 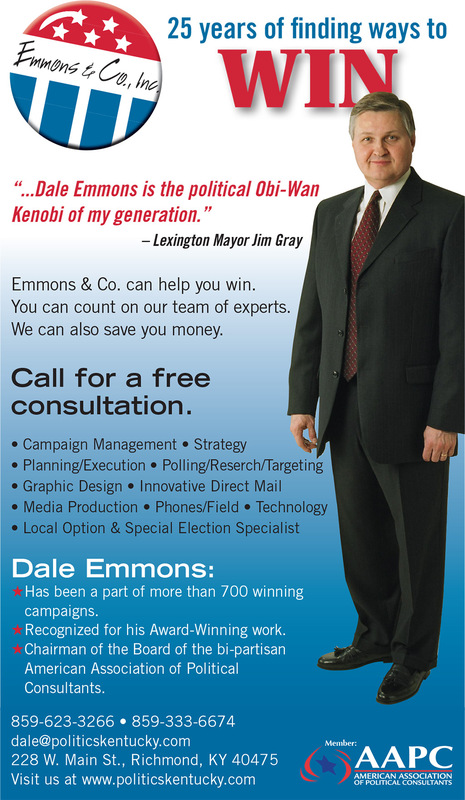 Dale Emmons is a Richmond, KY based Democratic political consultant. Dale has been part of nearly 700 winning Kentucky campaigns. He currently serves as President of the American Association of Political Consultants.